I had the opportunity to sit down with freshman Republican Congressman Will Hurd R-TX-23, who is seeking a second term. This November, Hurd will face-off with Democratic challenger Pete Gallego, who was defeated by Hurd in 2014. During the 40-minute, sit-down interview on the campus of Sul Ross State University in Alpine, Hurd discussed his triumphs and disappointments, challenges to cybersecurity, terrorism and presidential candidates Trump and Clinton. Hurd confirmed that, as we reported in the July issue of the Gazette, as noted by his opponent Pete Gallego, he does not live in the congressional district he represents, albeit by about 250-yards. Hurd also said Gallego does not live in the district, either, and says Gallego resides in Austin. The following is a transcript, with some minor editing, of my interview with Rep. Will Hurd. BBG: You have been in congress two years: congratulations. What are the highlights, what do you like best about the last two years? HURD: Two things: the fact that we have been able to get things accomplished, we’ve had four bills signed into law, bipartisan bills signed into law. I’ve had nine pieces of legislation pass the House; of those, four have been signed into law and we do believe two more are going to pass the Senate, and the President has talked about fast-tracking a bill that our bill that allows federal employees to be reimbursed for ridesharing and room sharing, the President has already talked about fast-tracking that legislationThat will be our fifth bill passed into law. Pending Legislative action after President Obama issued executive guidance for agencies to implement. BBG: How much money is that going to save the taxpayers? HURD: I don’t know the number off the top of my head, but it is a pretty significant amount. Here is the reality: there are a lot of ways we can reduce the size and scope of the federal government and make the government more efficient, and using this new technology to do it. Often times if you are using Airbnb, you are getting a room cheaper than if you were staying at a hotel. Using Uber or Lyft is cheaper than a taxi, When you look at all the federal employees that are traveling across the country, this is going to be a significant savings. Our first bill I got signed into law is making sure Border Patrol did not get a cut in pay[HR2252]. I have more border than anybody [else] in Congress, and only in Washington, D.C. do you think it is okay to—the way they were going to implement a pay reform a man or woman in Border Patrol was going to get a cut of $700 to $1,000 a pay period, and they get paid every two weeks. They do the same amount of work. We were able to stop that with this piece of legislation that fixed how they were going to implement pay reform. That is something that impacts on our district. We’ve closed out several hundred constituent cases; these are veterans who have a problem with the V.A. [Veterans’ Administration]. We had a woman whose husband passed away several years prior to her contacting us, and she wasn’t getting her V. A. benefits. She wasn’t getting the benefits she deserved as a widow of a veteran, and we were able to get involved and get her those benefits she deserved. We do that on Medicaid cases, Social Security cases. Being able to help people fight the bureaucracy is pretty awesome. BBG: You mentioned the Border Patrol; I know the Border Patrol union [National Border Patrol Council] had endorsed Donald Trump. Has it endorsed you? HURD: Good question. I don’t know if that’s the case? I think that was specifically in the primary, is what that endorsement was. BBG: Those are some of the highlights of your first term; what are some of the disappointments? HURD: Folks get caught up on rhetoric rather than solving problems, and that gets frustrating. When you’re moving fast and trying to do work for the district and you have to fight the bureaucracy, it is frustrating, and the bureaucracy is big and vast. I’ve seen that as a chairman of an [information technology] subcommittee [House Committee on Oversight and Government Reform: Subcommittee on Information Technology] and we look at cyber-security, we look at I.T. procurement, we look at how the federal government is protecting our information, and their inability to adopt new and cutting edge technology in order to protect individuals’ information, and its shocking. I use Social Security as an example: Social Security Administration has information on every single American, and our seniors are also incredibly vulnerable to fraud, and the tools that the Social Security Administration is using to protect that digital information is not where it should be. Dealing with that has been frustrating. BBG: Prior to being elected, you worked in cyber-security. Assuming you are re-elected, what are your plans for cyber security? HURD: I think we are going to continue on the track that we have been on. We have to make sure we improve information sharing between the federal government and the private sector. If we think the federal government can protect itself alone, or the private sector can protect itself alone, then we’re wrong. We have to make sure that there is improved sharing. I have crisscrossed this district dozens of times, we have done over 350 events, and there is only one thing that has come up in all of those and it is the question about cybersecurity. The question is sometimes in the form of, “I got a letter from OPM [Office of Personnel and Management] saying my information was stolen; what should I do?” Or, “My credit card keeps getting reissued from my bank and my bank won’t tell me why.” That’s a problem. There’s a nice building in Moscow [in Russia] right now with hundreds of people coding the next kind of malware that is going to be used to attack our financial infrastructure. The banks know it, the credit unions know it. They kind of have an idea what that next level of attack is going to be… Getting it back into the hands of the people who need it to defend themselves is really hard. One of the ways we do it is [through] the Department of Homeland Security; I sit on the committee, and have been involved in trying to do a lot of the reorganization of the entity within [DHS] that does cybersecurity. BBG: You mentioned this building in Moscow…. [Republican presidential candidate] Donald Trump encouraged Russia to find emails of the former Secretary of State [Democratic presidential candidate, Hillary Clinton]…. You are a former Central Intelligence Agency (CIA) guy: is that espionage? HURD: It is unacceptable for any major candidate, and candidate of a major party, to ask for an espionage to be done on another candidate. It’s unacceptable for a candidate to misuse classified information. So the reality is, we should not be surprised Russia is doing these things. The Russians are collecting intelligence to better inform their decision-making in the future, to influence populations. The Russians are incredibly good at information operations. They’ve been doing it in the Ukraine, in Syria and so this is an example of how Russia is not an ally, but an adversary. HURD: Collecting intelligence and breaking into peoples computer’s and stealing their emails is espionage, correct. BBG: In a recent interview with News4SA, you stated you were in the CIA for nine and a half years, protecting secrets, and that if you had engaged in the email behavior Hillary Clinton did, you would be in prison. HURD: Here are the facts: the former Secretary of State had an unauthorized server. The State Department did not authorize the use of an independent server in her basement that had relatively no protections. She didn’t have a dedicated Chief Information Security Officer. When the FBI [Federal Bureau of Investigation] did a review of the types of digital tools that could have been used to protect it, it was severely lacking. I’m paraphrasing the Director of the FBI’s words. We know at least seven of those emails were “Top Secret Special Compartmented Information.” This is basically human intelligence; this is the stuff that our partners overseas are risking their lives to collect. We know at least seven of those emails transited that unauthorized, unprotected server in her basement. That is a clear misuse and violation of, I believe, Section 793 of the Espionage Act, and the Espionage Act is more than just espionage. The Director of the FBI was clear in stating that the reason they did not go forward with prosecution is they could not determine intent. The law was not written with intent in mind. You didn’t have to clear the bar of intent. So the FBI and the DOJ used a higher level of burden of proof, if you will, in order to prosecute her. A translator in 2013 had CDs of interviews of interrogations at Guantanamo Bay and he was responsible for translating them. He had them in his bag, he ended up leaving Guantanamo, leaving Cuba, went to other places in the word, and forgot he had them in his bag. He had to do seventeen months in prison for that. I think that can be equivalent. So to me, if I would have done that, and the Director of the FBI even said, if one of his officers had done something similar [to Clinton’s use of an unauthorized server], there would have been serious ramifications for that. To me it’s unacceptable. If you or I were barreling down Highway 90 at 90 mph and we got pulled over and we said, “I didn’t know I was speeding,” what do you think? Would we have gotten a ticket? Absolutely. For me this is personal because…we can’t create a culture within our national security apparatus that says protecting classified information is not important. That to me is the biggest problem because guess what? Our young men and women who are going overseas, whether it’s in the military, fighting to protect secrets, or people who are doing the job I used to do, collecting these secrets, to have a senior official not protecting it is just unacceptable. BBG: Funding for the CIA: up or down? HURD: It is up to the CIA to request that. I think what we have to do is increase the amount of human intelligence that is coming out of major theaters like Iraq and Syria. Drone strikes are a tool and are effective; often times we need battlefield intelligence, we need to be able to get more information on some of these guys on what their targets are, how do they operate, what are their plans and intentions. I think we need to increase the number of human intelligence and if funding is a problem that is preventing that from happening, we need to address that. BBG: Donald Trump has proposed a border wall between the U.S. and Mexico. How do you think that will affect human intelligence along the border? And do you support or oppose a border wall as proposed by Donald Trump? HURD: Since 2013 I’ve been telling people that building a border wall from sea to shining sea is the most expensive and least effective way to do border security. A wall is valuable as a tool in certain places. When there is urban to urban contact, a wall makes sense. But you do not need to build a wall from sea to shining sea. What we should be doing is having an intelligence-based approach to border security. There are nineteen criminal organizations operating in Mexico. We should be targeting them and working closer with our Mexican partners. The other reality is this: when we talk about border security, we also have to talk about international commerce. Mexico is, Texas’ number one trading partner, and a lot of these communities are not two communities, they are one community separated by international boundary. We have to take that into account when we do these kinds of things. There are areas where we can improve unity of command within our border sectors. You have senior Border Patrol, senior ICE [Immigration and Customs Enforcement], and in a place like San Diego, Senior Coast Guard, and having one person in charge of all Homeland Security activities can ensure that our focuses are the same across all the different agencies within the Department of Homeland Security. BBG: What is your greatest concern for the future of this country? HURD: Terrorist organizations like ISIS’ [Islamic State of Iraq and the Levant] ability to inspire people even if they’re six thousand miles away. When I was chasing Al-Qaeda in Pakistan and Afghanistan, they would do something called night letters. They would leave a letter on a door trying to influence people. You could hit a couple hundred people. ISIS is doing four social media campaigns a day, translated into 49 different languages and dialects, that are hitting hundreds of thousands of people every single day. They are inspiring terrorism when they don’t even touch people. We have to address the ideology. As a country, we are not doing a very good job. We can’t rely on government alone to do this. We need civil society evolved. We need to be working with our Arab and Muslim partners in the Middle East in order to do that. We have to attack that ideology because as long as that ideology exists, whether its Al Qaida, ISIS, or Al Shabaab [The Harakat Shabaab al-Mujahidin] or the next group, you’re still going to have those entities that are going to threaten our way of life. BBG: Moving back to domestic issues and policy, during my June interview with Pete Gallego, he said that you don’t live in the 23rd Congressional District. Do you live in the district? HURD: I am two hundred and fifty yards from the district. My house—which is my house, I do not live with my parents [a claim Gallego made}—is two hundred and forty yards from the district. Did you ask my opponent [Pete Gallego] the same question? BBG: No I did not. I thought he lived in San Antonio? HURD: No he does not; he lives in Austin. BBG: During my interview with Gallego, he brought up HB 399 that you coauthored last year, the Border Security Bill that called for building 191 miles of roads in the Big Bend Sector of the US Customs and Border Protection. Gallego claimed those roads would have been built in Big Bend National Park. Is that accurate? HURD: It is untrue. Untrue. I’m outraged when someone tries to claim that I’m not fighting on behalf of Big Bend and the other national parks. I have seven national parks in my district, more than anybody else. I’m one of the few Republicans that is actually fighting for additional funding for the National Park Service. I’m glad he alluded to this. The Big Bend Sector [of Border Patrol consists of] 77 counties in Texas, the entire state of Oklahoma, and has 515 miles of the border. As you know, Big Bend National Park has only 118 miles of the border. Some of those roads that were proposed were the repaving of existing roads in the park, in conjunction with the National Park Service. We were also going to use some Department of Homeland Security funds to pay to upgrade some Park Service facilities. Some of the [national park] facilities for park staff are very, very rudimentary, and that was included. The number of actual roads that were going to be in the park were in conjunction with the Park Service, and it’s not hundreds [of miles], it’s in the single digits. That is completely false. One of the reasons why Pete [Gallego] was a failure when he was in Congress is because he doesn’t understand some of the nuance and details when it comes to major projects like that. 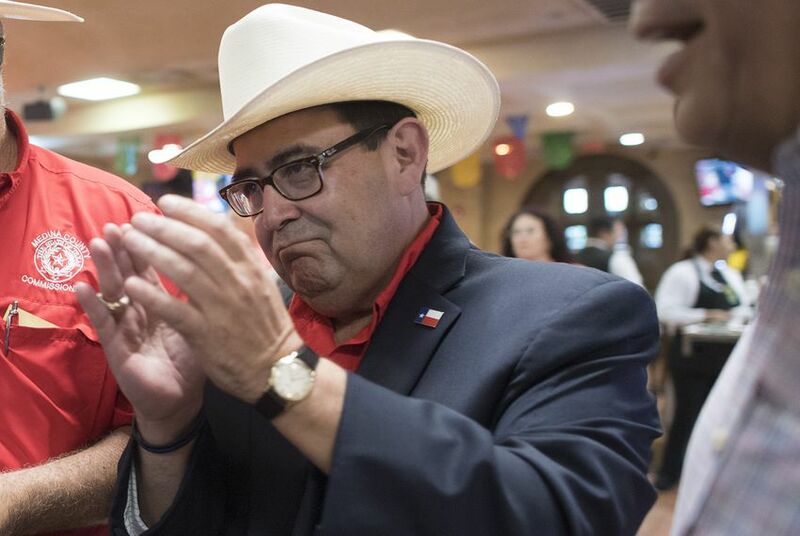 BBG: Speaking of your opponent [Pete Gallego] is there anything else you have to say? HURD: People should be asking: what did he do when he was there and why does he deserve to go back? I am proud of my record of accomplishments and what we have done for this district. BBG: Give me a few bullet points; what have you done? HURD: Four bills signed into law, all of which impact the district. Helping hundreds of constituents deal with the bureaucracy. Being a leader on national security. Leading on border security. Talking about international commerce with Mexico. One of our bills that we got signed into law was the Coordinated Border Initiative that allows municipalities to take some of the highway trust fund dollars and improve infrastructure on the border so you can facilitate movement of goods and services. [On the Trans-Pecos Pipeline:] I support these sort of energy projects if they are done properly. My initial concern was making sure we had the right safety protocols that were being followed and there was a level of transparency. We’re the ones that wrote a letter to FERC [Federal Energy Regulatory Commission]. Pete Gallego knew about the building of this pipeline when he was in Congress, never spoke up about it. He took money from the people building the pipeline. He’s a lawyer; he could have easily sent a letter to FERC. But it was me who supports these kinds of projects to insure we are insuring the right safety of our communities and a level of transparency to ensure property rights are being protected. BBG: You mentioned international trade. Do you support NAFTA [North American Free Trade Agreement]? HURD: Absolutely. It was signed in San Antonio. It has a huge impact in these 29 counties I represent. This is where I can draw a contrast with my detractors including my current opponent. This is something that even Hillary Clinton is talking about, the need to be re-looked. Both of the major candidates for President are talking about the need to re-look at some of these things. When you look at the level of support that my opponent has from labor unions who are against these kinds of agreements…trade is the lifeblood of this district, it is the lifeblood of our border, and we should be doing things to increase it. It is so important to talk about it. My time in the CIA, when I was in business looking at international commerce, there are a couple ways you improve your economy: you bring your debt, or you increase taxes, which I don’t think many people are for. You decrease spending, which is really hard to do, and you divide the government or you increase your economy, and one of the quickest ways to increase your economy is to grow trade and there is no better partner to do that with than Mexico. That’s NAFTA. BBG: Can you talk about your efforts to bring school groups to Blue Origin’s rocket site [north of Van Horn, TX]? BBG: What other schools have been brought to Blue Origin? HURD: Alpine, El Paso, Van Horn, Marfa. HURD Chief of Staff, STONEY BURKE interjects: [Alpine City Councilman]Rick Stephens, with his education effort with his wife, has been instrumental in helping coordinate with schools. HURD: We’re glad Blue Origin has taken this and run with it, and inspiring kids from around the region. It’s pretty cool. They are on the cutting edge of technology. [On the McDonald Observatory:] Some of the leading scientists in the world on dark matter are in Fort Davis. It really is awesome. This is one of the cool parts of the job; I get to see the neat things in the district I represent, and play a little part in keeping things out of their way so they can continue to do their thing or figure out ways to bring in some leverage in some form or fashion to allow them to do more of their thing. Constituents will have the opportunity to meet Rep. Hurd on Friday, August 12 at The Enlightened Bean at 201 W. O’Reilly Street in Presidio, from 10-11 am, and the same day at Dairy Queen located at 2800 US.90 in Alpine, between 1:30-2:30 pm. Gazette reporter Matt Hagerman will cover the Alpine event.